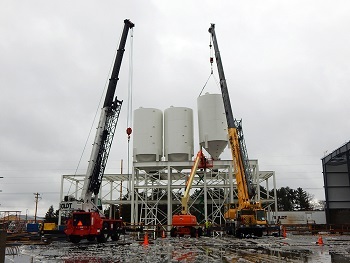 Bulk storage silos being put on a structure for a paving plant. An example of a large anchor bolt hole for an extreme seismic zone. Navigating building codes can be a challenge for even a seasoned veteran. The following is an overview of a couple of particularly important areas of building codes that affect design and fabrication of industrial storage silos. Unfortunately, this is often times not an easy question to answer. Want to put up a large field-fab tank for oil storage? API 650 is an appropriate code for that situation. If you are looking for a water tank, AWWA D100 is going to tell you exactly what you need to do. What happens, though, if you are looking for a new lime silo for a water treatment plant? What about a plastic pellet silo for your molding operation? In these cases, the question is not as clear cut. There is no national code or standard in the U.S. that specifically covers the design of silos for the storage of bulk solid materials. For this reason, the design of these tanks from place to place and company to company will vary, and is often a topic of debate. While the debate won’t be solved in this article, there are some specific things that need to be taken into account, regardless of how the silo itself is designed. First and foremost are the building codes – the International Building Code, or IBC – that will determine the wind and seismic factors used in the design of the silo itself. Regardless of how you design the silo structure, you will need to know the wind loads and seismic loads present on that silo before you can even begin. 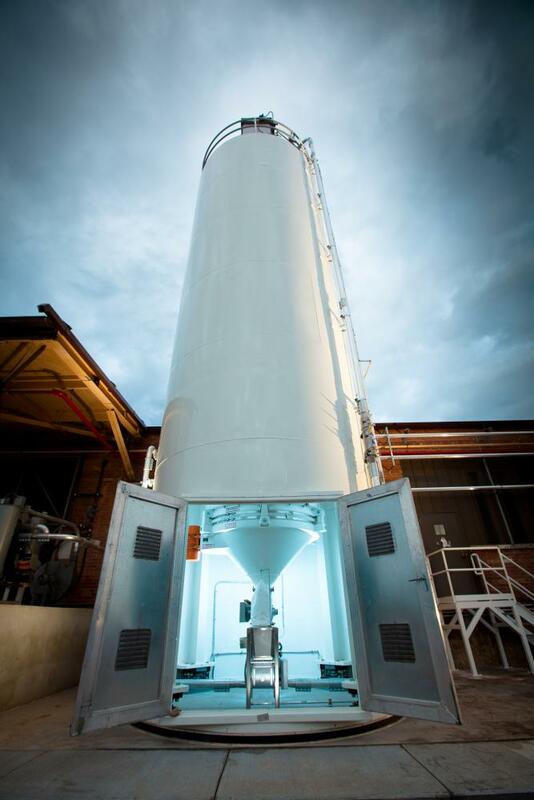 Two silos of the exact same size and used for the exact same material will be designed differently if one’s going to Wisconsin and the other to California or Florida. The loads that are present on the silo will also be an integral part of the design of the silo’s foundation, which is likely the first thing you will have to worry about, often times months before you will ever receive the silo itself. In order to properly design the concrete pad or steel structure that supports the silo, the engineer performing that work will need to know a specific set of design parameters. These will include horizontal loads and overturning moments for both wind and seismic situations. 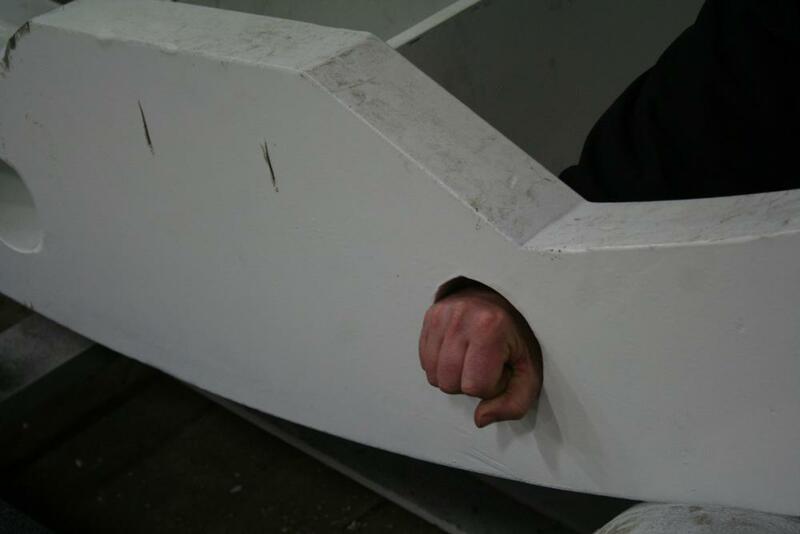 It will also include anchor bolt plans and uplift forces. With this in mind, which IBC code do we use to get these numbers? The best way to determine this is to actually contact the local building official and ask them directly. If this is not possible at the point in the project that this information is required, the International Code Council has a website (www.iccsafe.org) that lists current codes in a variety of jurisdictions. Every state in the U.S. has adopted some form of the IBC building code. This could be IBC 2006, 2009, 2012, or 2015. Depending on the code that you are using, you will have different seismic and wind numbers. Concerning seismic values, there are a few things to keep in mind. Gone are the seismic zones 0, 1, 2A, 2B, 3, and 4. Although you will still see this terminology used in some places, these seismic zones are part of the old UBC (Uniform Building Code) series of codes. The last UBC code was published in 1997, and the UBC codes are gone from virtually every jurisdiction in the country at this point. The IBC codes use a completely different system for assigning seismic values to areas around the country. Contained within the IBC codes are the seismic values that are required to design any building or structure to resist seismic forces. The 0.2-second spectral response (Ss) varies between 0 and 300%g, while the 1-second spectral response (S1) varies between 0 and 125%g. There are many other factors that need to be taken into account in the seismic design of silos, but at the core, the Ss and S1 values are what are required to begin to determine the seismic loading present on your silo. Maps of both Ss and S1 values can be found in the IBC code books. The USGS (United States Geological Survey) website also has a tool for finding these seismic values. Wind values are also crucial in silo design. Most important to know is that IBC 2006/2009 use a different set of load combinations when determining wind loads versus IBC 2012/2015. The base wind speed used for the different versions of the code are different and therefore not interchangeable. The base wind speed in the older codes (2006 and 2009) is 90 mph, while the base wind speed for the newer codes (2012 and 2015) is 115 mph. Due to the difference in factors present in the load combinations for the different codes, the end wind load that needs to be applied to your silo will be roughly equivalent between the old codes and the new codes, even though the base wind speeds are different. What this means is that if you use a 115-mph wind loading with the IBC 2006/2009 codes, you are going to get a wind loading that is higher than what you would actually need to design to. More dangerous would be mixing the wind speeds up the other way around, and using the lower 90-mph wind speed with the new codes. If this is done, the wind loading applied to your silo will not be as high as it should be, and your silo and foundation will end up being under-designed with respect to the wind loading. This affect could be even more pronounced in higher wind zones on the coasts were your design wind speeds go up to 150 or 160 mph or beyond. It should also be noted that although we discuss all of the above in the context of following the IBC codes, at the very least you also need to use ASCE 7 – Minimum Design Loads for Building and Other Structures, in order to actually go through the mathematical exercise of figuring out the wind and seismic loadings for silos (or anything else for that matter). While the basic numbers required to do the math are contained in the IBC codes, the IBC codes refer you over to the ASCE codes (ASCE 7-05 for IBC 2006/2009 and ASCE 7-10 for IBC 2012 and 2015) for the equations required, as well as for the values of some other variables contained within those equations. All said, there are many things to consider when it comes to the codes involved in the design of a bulk storage silo, even before you get into the actual design of the silo itself. Troy Hanson is engineering manager, Imperial Industries Inc., Wausau, WI. For more information, call 715-359-0200 or visit www.imperialind.com.